If you are looking for ways to lower your score, one area you must practice is your lag putting. Teaching pro Daniel Blackwell shows you how. If you are looking for ways to lower your score, one area you must practice is your lag putting. Strong putters have good distance control skills and this helps them hit the ball on their desired line with the appropriate pace. When this combination is improved so will your proximity to the hole on your first attempt. The following drill is simple, yet effective, and an encouraging way to improve your pace control and reduce the amount of putts you have throughout your round. 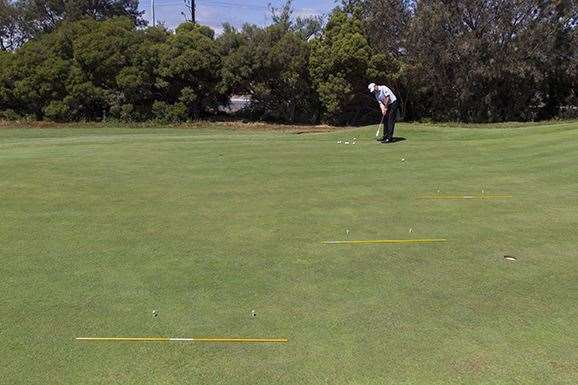 Lay three clubs, or alignment sticks, horizontally on the ground – one placed at six metres, eight metres and 10 metres. Now, create a gate using tees which are a metre apart and about 30cm ahead of the rod (pictured below). Once the drill is set-up, address the balls and hit to the random gates. Your goal is to hit the ball through the tee gate but short of the rod on the ground. When doing this drill avoid repeating the same gate twice, instead try to randomise each putt to become familiar with the difference between the distances and how far your putter head needs to travel back and through, all the while maintaining a smooth tempo.